Featuring a reproduction of an early English royal coat of arms, the English Royal Lion Shield is beautifully detailed with solid steel fittings and aged with golden veins. This shield can be easily mounted with the display chains. 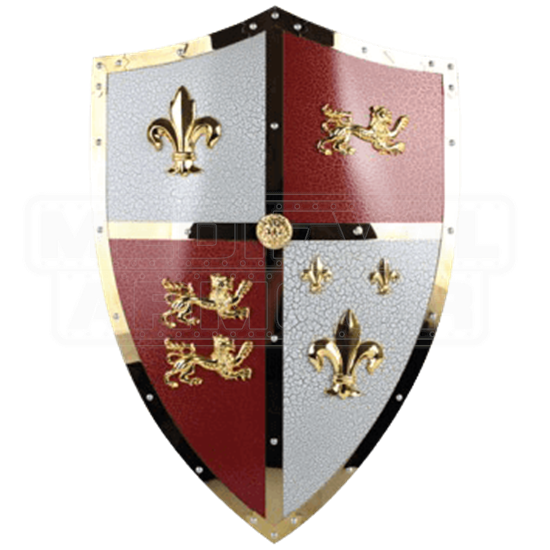 Made from quality stainless steel, the shield features a quartered design with red and while colors. The red fields display three passant guardant lions, while the white shows four fleur de lis icons. A lion head is placed at the center of the coat of arms. Golden steel lines the edges of the shield and forms a cross through the center. Rivets dot the edges and secure the trim in place. 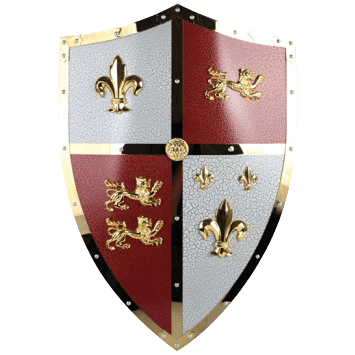 This stunning shield is a wonderful decoration for your home, and it makes a great costume accent to carry at your side.